"When You're In a Pikle, Just Dill With It!" What does that mean? I have just been introduced to an amazing new product that is what every mom needs to keep with them at all times (they also make ones for dads too). 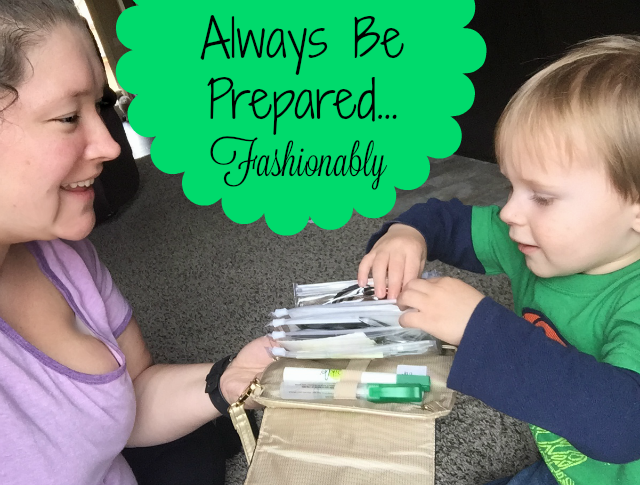 So let me explain, I am one of those moms that likes to always be prepared for anything that life throws at me. But I don't want to carry around an enormous diaper bag anymore and honestly didn't like doing it when my babies were little. But kids need stuff! 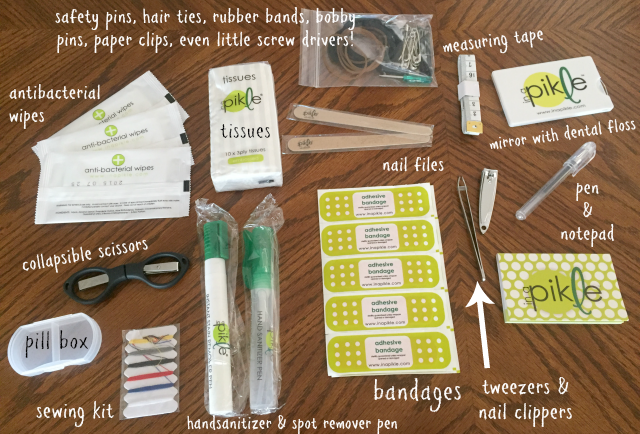 They get boo-boos and need bandages, they get messy and need wipes, and sometimes you need stuff too! As you may know, we are starting on a healthy lifestyle this year and with that comes more adventure which can mean more predicaments for the need to be more prepared. That's why I'm loving my In A Pikle bag. First of all, I want you to check out how super cute and fashion forward these bags are! They do have more neutral options as well. But if you follow me on YouTube, then you know that I am absolutely in LOVE with GOLD right now! This In A Pikle looks like a bag I would buy for myself. And I love the little bow accent. It also has a little zippered pouch on the back. The wristlet in gleaming gold is additional, but makes it perfect to carry. 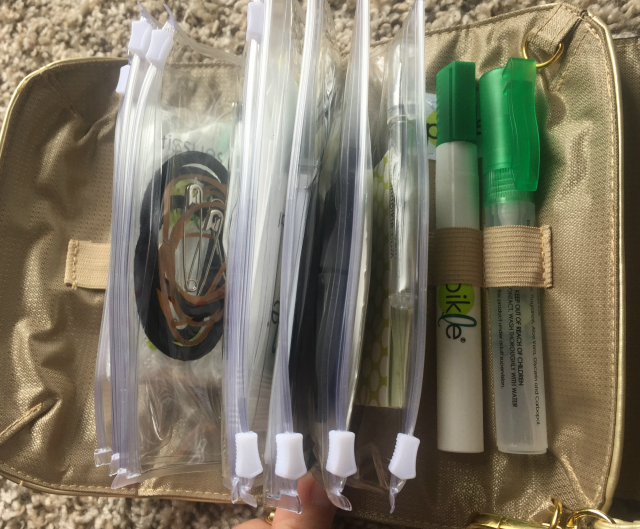 Even when completed filled with everything from the complete starter pak, there is still room for extra stuff like your favorite lip balm or gum. We went skating this past weekend, my daughter started getting a blister, but I was prepared! And then when we were outside, the kids immediately wanted to remove their arm bands, again prepared because although normally I don't carry scissors, but now I had some. My mother-in-law hinted how this would make a great gift and I would definitely have to agree! Do you always like to be prepared? What do you think of In A Pikle? Although I received complimentary products to provide this review, all opinions are my own. OMGOSH I LOVE this!! They are adorable and SO handy!! Need one!! Well, that has pretty much everything right there! You could carry epipens if you need them, in place of a marker. Great concept. This is a super idea. I need one of these also. I am a person that likes to be prepared. 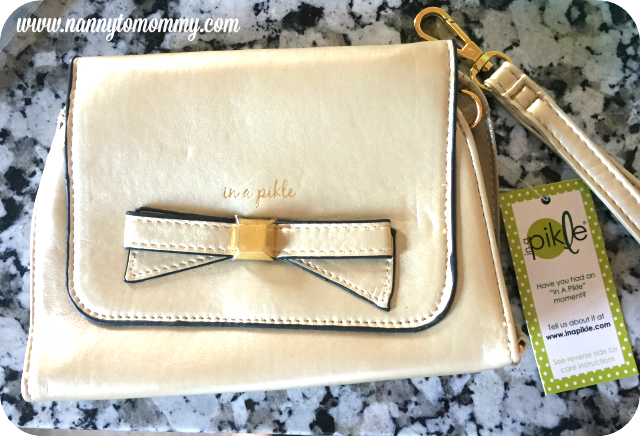 That's a cute pickle purse for all the mama have to haves to be prepared. Cute saying too.